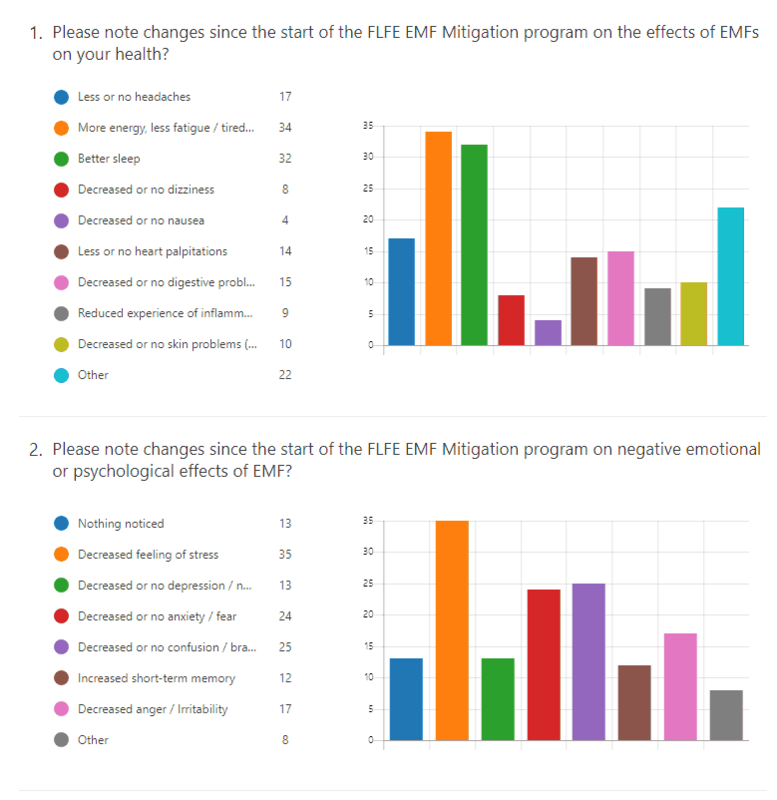 The EMF Mitigation Program is included in all FLFE subscriptions. FLFE’s EMF Mitigation Program changes the way EMFs are influencing our lives. The FLFE high consciousness field service works in multiple ways, including adding the energetic signature of Shungite, to harmonize any consciousness-lowering EMFs in your environment. Below, you’ll find more details, research on the effects of the EMF Mitigation Program, information on EMFs, subscribers experiences of the program, and more. Read more about EMFs and the FLFE EMF Mitigation Program below. What are EMFs? Are they harmful? How does EMF Mitigation Work? How might you be affected by consciousness-lowering EMFs? How do we tell the difference between supportive and potentially harmful EMFs? We believe we may have one way to determine that…and a possible solution to mitigate the harmful effects. Naturally generated. Natural low-frequency electromagnetic fields are generated by the sun, thunderstorms, and currents circulating in the core of the earth. Certain locations on the planet with a concentration of minerals can also generate or amplify an electromagnetic field. This can happen on its own, or in combination with a specific geographic influence. It is postulated that the earth has a grid of energy called ley lines that correlate with or is similar to the energy grid of meridians in the body as identified in traditional Chinese medicine. The combination of ley lines and/or vortexes and/or positive energetic geographic influences can potentially create pilgrimage sites. Human-generated. Humans generate EMFs via heat as infrared waves, biophotons, thoughts, etc. Machine or technologically generated. Cell towers and emitters — such as the new 5G frequency, cell phones, routers, laptops, baby monitors, cordless phones, refrigerators, microwave ovens and radio frequency devices such as a smart-meters all generate EMFs. Fragmented wave-forms, also referred to as EMF- or electronic-smog, are incomplete or partial electromagnetic field signals that lower consciousness in an environment. These can have multiple causes including EMF signals that have broken into smaller pieces due to the distance from the source of the EMF signal, EMF signals reflecting in and around an environment, wave-forms crossing or interacting, and more. Our specialty is consciousness. We believe the human body is a sensitive instrument and we use kinesiology, or muscle testing, to measure consciousness. FLFE services activate a high-consciousness field around a property, cellular device, or object and increases the life-force energy, also known as prana or chi, present there. We measure the level of consciousness of new properties on FLFE on average three times per week and of all current subscriptions once a week. Certain factors lower the level of consciousness of the environment, such as some types of EMFs, which sometimes dramatically lower the level of consciousness. We call these consciousness-lowering EMFs. Electromagnetic fields can be positive and raise consciousness, including many of the energies naturally generated by the earth. Consciousness-lowering EMFs include other sources of EMFs in addition to machine or technologically-generated consciousness-lowering EMFs. Our research indicates that many machine or technologically generated EMFs are consciousness-lowering for an environment. It is our assertion that the level of consciousness of an environment is one of the most important measures of its life-supporting aspects, including its ability to provide optimal health. While traditional EMF readers measure magnetic and electrical fields present in an area, they are not designed to measure the consciousness-lowering influence that some EMFs may have. Therefore, our measurement of consciousness-lowering EMFs is not using traditional EMF meters to read the magnetic and electrical fields present. These devices have, so far, not shown a difference in the readings with the FLFE EMF Mitigation program on and off. They are not reading the subtle changes in the EMFs that we call “harmonization” that transform a consciousness-lowering EMF into a positive consciousness raising energy. There are other measuring devices that are more sensitive to subtle energy changes. Gas Discharge Visualization devices are one of those. K. Melissa Waterman is an advanced practitioner of GDV and has done extensive work over several years measuring the energy in a space at Dr. Joe Dispenza’s events. The chart below shows GDV readings in the same home over a 12 hour period without FLFE/EMF Mitigation (in RED) and over a 12 hour period with FLFE/EMF Mitigation (in Blue). 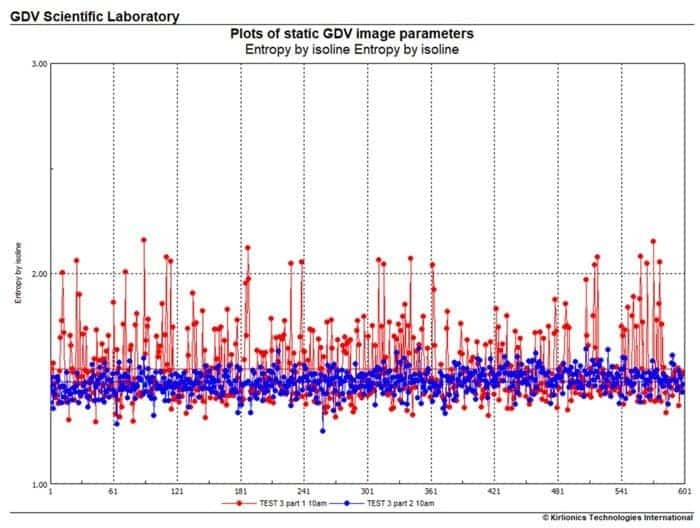 It shows a reduction in the variability and peaks of the energy present, the red points showing much larger swings and therefore more energy chaos. With the FLFE field and the EMF Mitigation program on, the environment is significantly more coherent, with much fewer energy spikes and reduced chaotic energy. It is our assertion that the lower amount of chaotic energy represents the effects of reduced or harmonized EMFs, and the many other benefits of a high consciousness field. How does FLFE’s EMF Mitigation Program Work? Two discoveries were important for the mitigation of the consciousness-lowering effects of EMFs in an FLFE field with this program. First, we discovered that if you raise the level of consciousness (LOC) of a device emitting consciousness-lowering EMFs, at a certain LOC the EMFs emitted are greatly effected. They will either become neutral and neither raise nor lower the level of consciousness, or will increase the level of consciousness of an environment. The device, including the antenna, is vibrating at a high enough level to cause the EMF energy they emit to become either consciousness-increasing or neutral. We call this harmonization. We apply this to cell phones in the FLFE EVERYWHERE service. Second, our research revealed that shungite is the most effective substance for harmonizing, neutralizing, deflecting, and dissipating EMF energy. Shungite is a black, lustrous, mineral-like substance from meteorites found mainly in Russia. Many people are aware of shungite’s capabilities. This program mitigates, or greatly reduces the effects of, the consciousness-lowering effects of EMFs on an environment. At this time, we cannot guarantee a 100% reduction in consciousness-lowering effects of EMFs. See our measurements of the mitigation HERE. This is a rapidly changing field and we will continue to upgrade the service as new technologies appear. 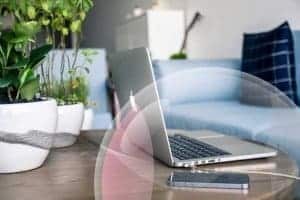 Consciousness-lowering EMF energy can originate inside an environment from some of the conveniences of modern life such as WiFi routers, computers, and appliances. The FLFE EMF Mitigation program automatically brings the level of consciousness of all devices within its service field to a level of consciousness that will harmonize it — much like our FLFE EVERYWHERE service does with cell phones. Incoming consciousness-lowering EMF signals from outside the environment are also harmonized by the energetic signature of shungite present in the FLFE Field. The FLFE service will harmonize incoming consciousness-lowering EMFs by raising it to a high enough LOC to neutralize the negative effects. For high-strength consciousness-lowering EMFs, this could potentially raise the LOC of the property above 600 on the Hawkins Map of Consciousness. If such high levels are required, FLFE’s EMF Mitigation Program will instead dissipate the energy. In contrast, some of our customers have environments with a LOC over 600 due to the influence of high consciousness people. FLFE (and the EMF Mitigation program) in no way limits the natural level of consciousness of an environment or of the people in it. All consciousness-lowering EMF devices within the property boundaries on the FLFE service are automatically brought to the appropriate level of consciousness to harmonize their EMF emissions. Incoming consciousness-lowering EMF waves from outside a property are subjected to the FLFE field including the energetic signature of shungite, which climbs up the waves toward the source until they are harmonized, neutralized, deflected, and dissipated. Fragmented wave-forms, or EMF smog, are neutralized and removed by the FLFE field with the energetic signature of shungite. Please see the “How does the FLFE EMF Mitigation Program Work?” section above for more details. Many people report a “cleaner”, “fresher” feeling in the environment and also report having more energy, clearer thinking, less anxiety and a more restful sleep. Pets and plants benefit as well. 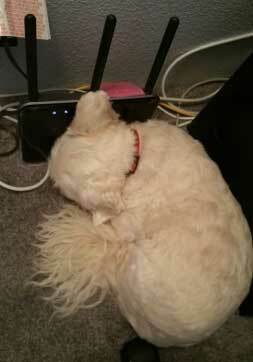 Brenda Michaels and Rob Spears of Conscious Talk Radio are FLFE subscribers and the EMF Mitigation program suddenly had their dog Cosmo sleeping on the Wi-Fi router. 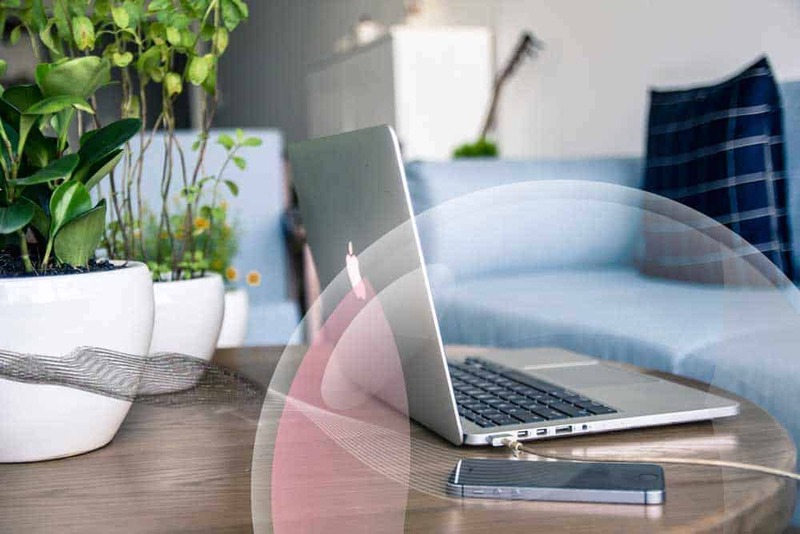 The FLFE EMF Mitigation program for FLFE EVERYWHERE phones and objects is a 10-foot diameter bubble of EMF mitigation that moves with you. In order to create the 10-foot diameter bubble of EMF mitigation, all devices emitting consciousness-lowering EMFs within 50 feet of the phone or object will be brought to the appropriate level of consciousness to harmonize their emissions. Incoming EMF signals from outside the 10-foot diameter bubble will be harmonized, neutralized, deflected, and dissipated by FLFE with the energetic signature of shungite. Fragmented wave-forms, or EMF smog, are neutralized and removed from the 10-foot diameter bubble by FLFE with the energetic signature of shungite. There may be some limitations to the removal of all fragmented wave-forms depending on how fast the phone or object is moving. Please see “FLFE’s EMF Mitigation Percentage” section for more details. We make the above claims using kinesiology testing research. We encourage you to test this yourself by how you feel with FLFE EMF Mitigation program turned on and off. Click here for our measurements of EMF Mitigation for various FLFE services. What is Focused Life Force Energy (FLFE)? FLFE’s mission is to support the optimal conditions for the evolution of consciousness in an economized society. Or more specifically, we support the creation of environments with high consciousness fields. These fields provide a sanctuary that is helpful for improvements in our personal growth and increased health while we remain highly functional in our everyday work life. FLFE has an operational and philosophical framework built upon the work of Dr. David Hawkins (author of Power vs Force). We believe that consciousness is everywhere and that it is a field with certain characteristics. Dr. Hawkins’ body of work goes into great detail about the characteristics of these fields at different levels of consciousness. We use Consciousness Kinesiology, which accesses the innate intelligence of the body, to measure the level of consciousness in the fields activated by FLFE. We believe that a minimum level of consciousness of 560 on the Dr. David Hawkins Map of Consciousness is ideal for the sanctuary environment as described above. North America averages at 422 on the Hawkins Map over the past year (as of November 1, 2018). Read more: What the FLFE environment is not.